It was in October, of course, that O’Reilly came on “The View,” and Behar walked off the set over his comments about Muslims. The fallout from the incident continued for days, and indirectly led to the firing of Juan Williams from NPR for comments he made when discussing the incident with O’Reilly. 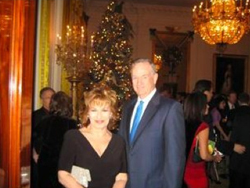 On Friday, though, the two reunited, and Behar tweeted a picture of the encounter.